The clean lines and striking visuals of this exhibition panel system helped Coveris present a new product by appealing to the senses and generating curiosity in a busy exhibition hall. Thanks to research and manufacturing excellence, Coveris’ Advanced Coatings Division provides a range of protective products dedicated to improving the lives of millions of people, every day. To help the company present SentientTM – a high-performing foam for wound dressings – at MEDICA, the most important global gathering in the industry, with over 5,000 exhibitors and 17 exhibition halls. Our client required a cost-effective exhibition solution that would help them maximise their presence at the show, by generating curiosity and a desire to find out more. 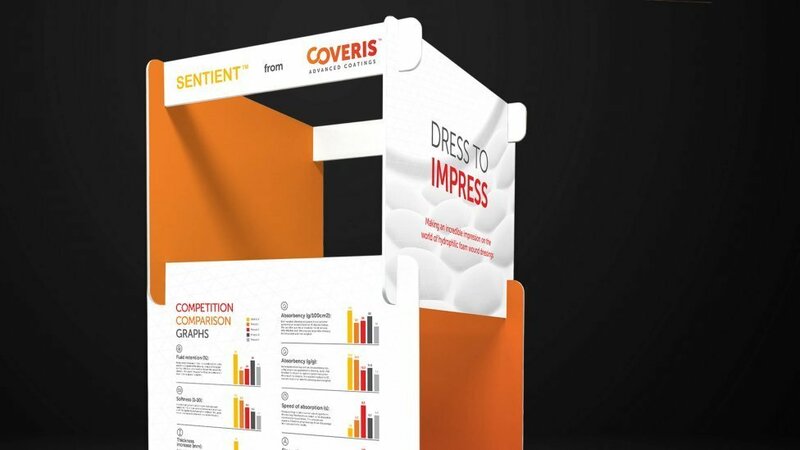 A simple yet highly effective exhibition panel system makes a hero of Coveris’ technology, and succeeds at attracting delegates to the stand, eager to engage in conversation or pick up a brochure to find out more about the product, and the technology that makes it a reality. The design relies on striking 3D renders and accents of colour. Clean visuals and shades of white dominate, and are the ideal vehicle to transmit the concepts of protection and reliability. 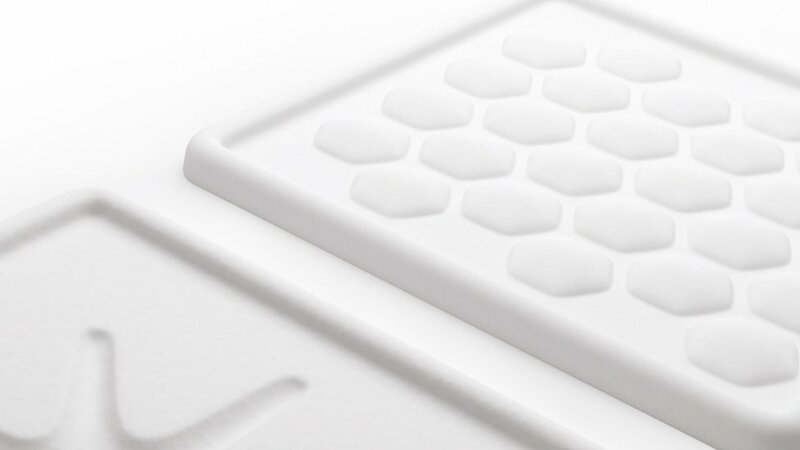 Close-up detail enhances the experience by appealing to the senses – visitors feel they can touch the technology. 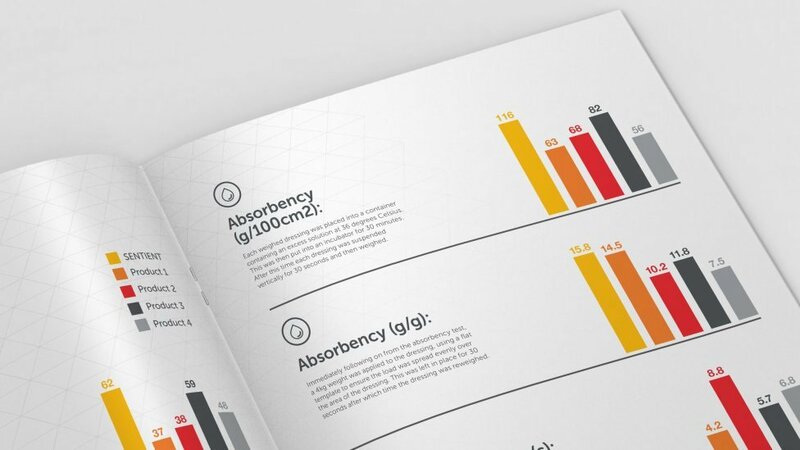 The panel system features highly visible stats, serving as a teaser of key product information included in the sales brochure. Easily transportable and designed to last, the exhibition panel system is a highly cost-effective solution. 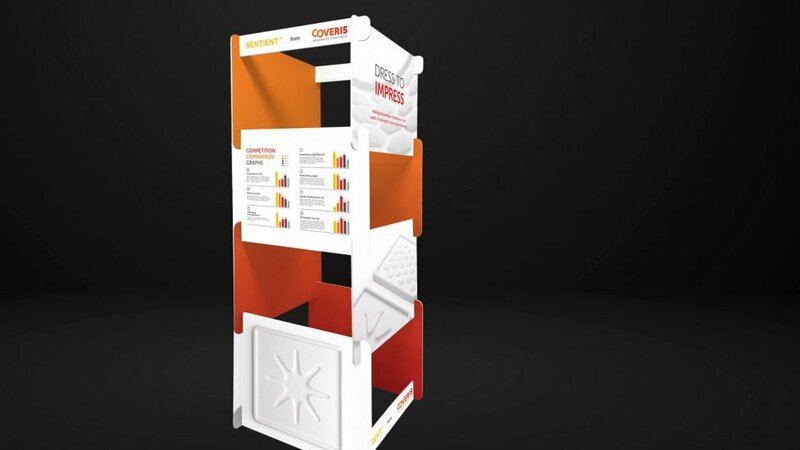 With this portable display stand we not only helped our client realise significant cost savings by repurposing an existing design, we also ensured their audience enjoyed a fresh yet consistent experience one year on, strengthening their brand.